Distinct. Direct. Meaningful. Add a personal message with a branded compliment slip. You might think scribbling on a simple scrap of paper will suffice. But for that personal, professional, and meaningful approach, you can’t go wrong with a custom-printed compliment slip. Whether you’re answering a customer enquiry, or simply saying ‘thank you’, do so with a touch of class. 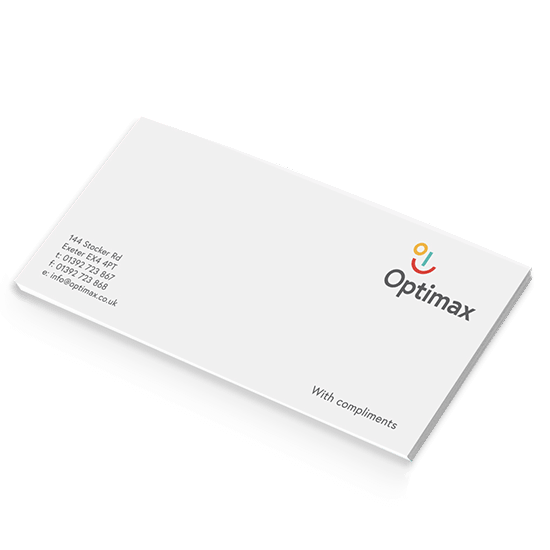 Our compliment slips are available in DL (105 x 210mm) or DL Small (99 x 210mm). And for a real eye-catching, quality look, try the spot ink print option. We cannot print multiple spot colour inks. Only one single spot ink is available print file. For the very best results, we recommend that the spot colour does not overprint a background colour and is instead set to ‘Knockout’.